Filed under apple on August 05, 2011. Last night I unpacked the Mac Mini I purchased from Amazon and connected it to our Sony Bravia 55” HDTV. 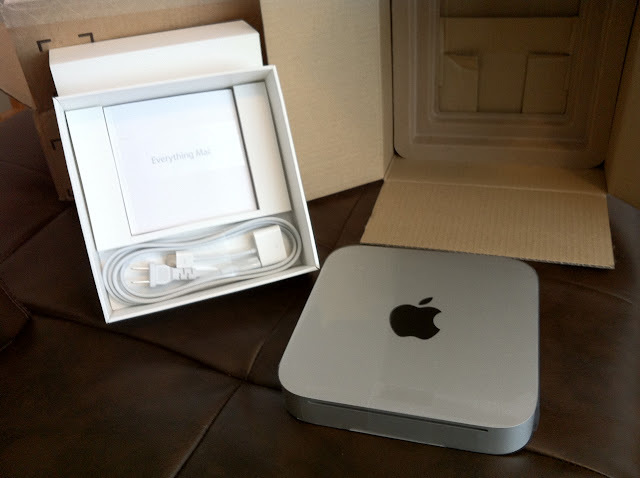 After hitting the link below, you’ll find images from that unpacking (in all their exciting glory) along with some notes that might be useful for folks with a limited technical background who are also converting a Mac Mini into a Mac Mini Media Center (MMMC). 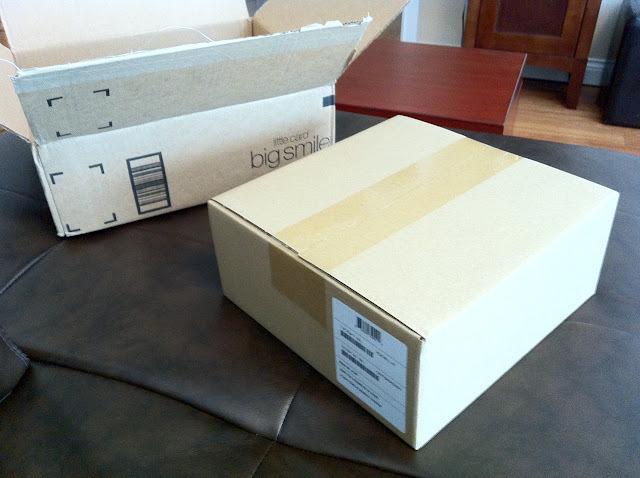 We begin the unpacking process with the always fun part of taking the smaller box (Apple protective packaging) out of the bigger box (Amazon shipping box). Oh look, another box in a box! 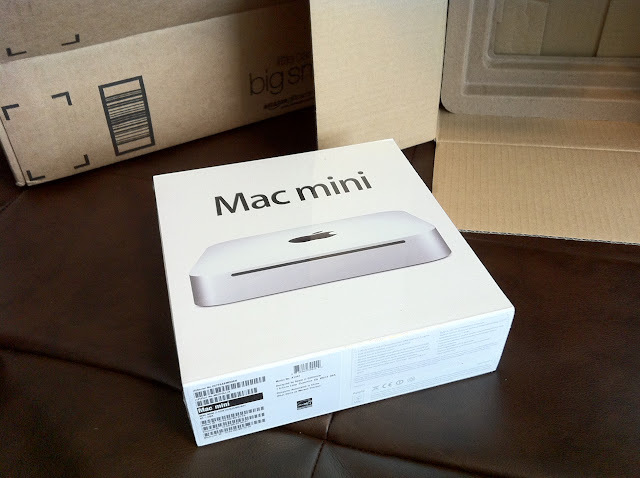 Here we have the Mac mini box. 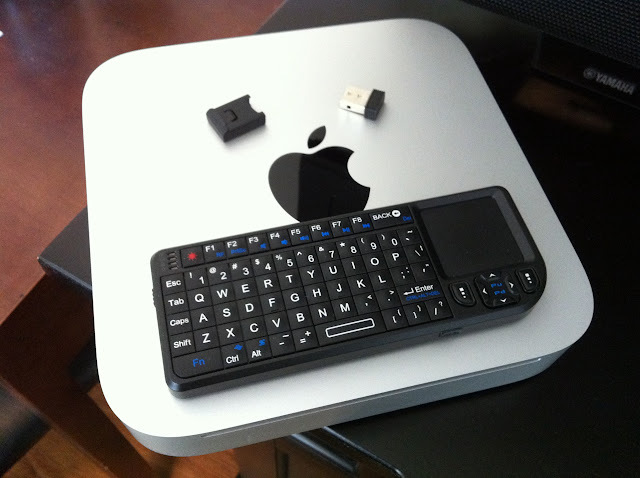 I just noticed, Apple names it the “Mac mini” not the “Mac Mini” as I have been writing it. Must take care in the future to use the proper nomenclature. 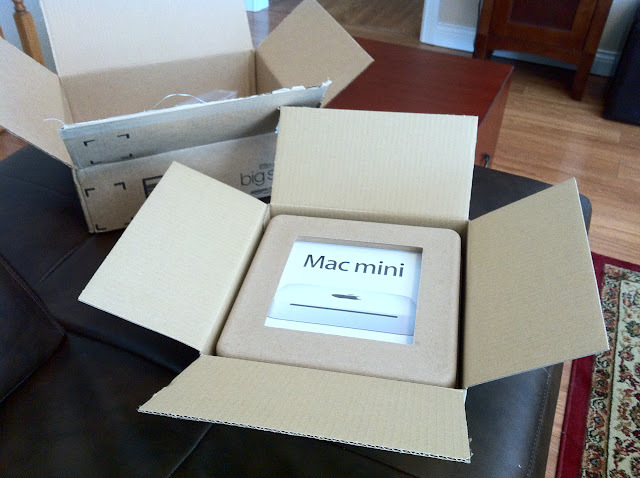 Don’t look, the Mac mini box has it’s top off. The glare you see is from the protective plastic that surrounds the boxed Mac mini. 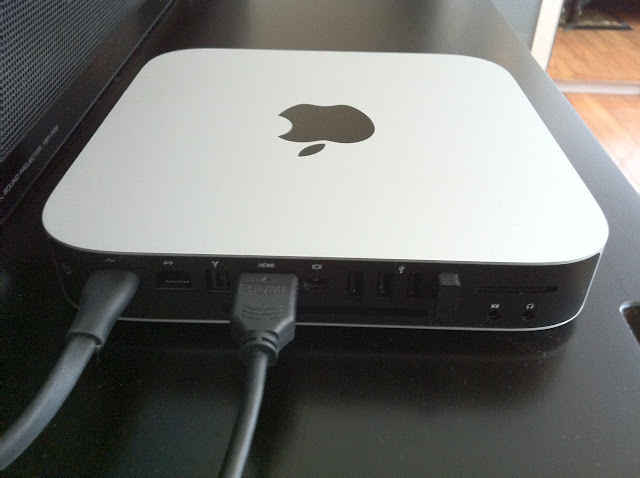 This last generation Mac mini looks a lot like the first version Apple TV. The amazing thing is that it is over twice as powerful and sips a lot less juice from the 110 outlets (thanks to Colin for the info). As I also mentioned in a previous post, I chose the last generation Mac mini over the latest version because we wanted the SuperDrive to rip and play CDs and DVDs. 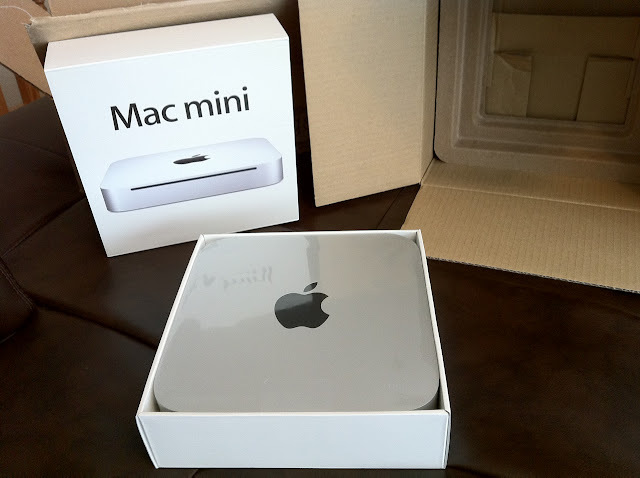 This generation Mac mini, as does the new version, also includes the secret sauce that makes the Mac mini the perfect MMMC; an HDMI port. Get your HDMI cables at Amazon! They are much cheaper and of really good quality. No tax and also no shipping for Amazon Prime members. Note to photographers: turn off HDR on the iPhone when taking pictures where you are holding objects. Unless you grip is rock solid, you get the blurred image shown below. Until I figure out how I am going to control the MMMC day-by-day, I am using this Rii mini USB keyboard and trackpad that I use in the classrooms. It really works well with the Mac mini and If I continue to like it, I will purchase this $37 device for the home as well. This could end up being the full-time remote for the MMMC. I’ll keep you up to date. 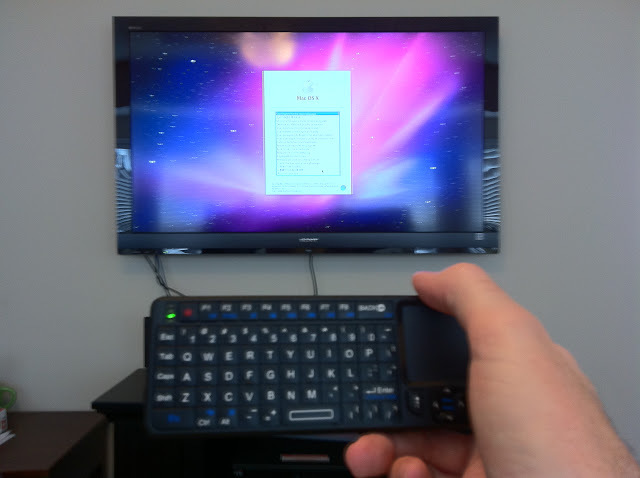 You have to love HDMI on the Mac mini. Only two cables to connect: the power to the wall and the HDMI to the HDTV. 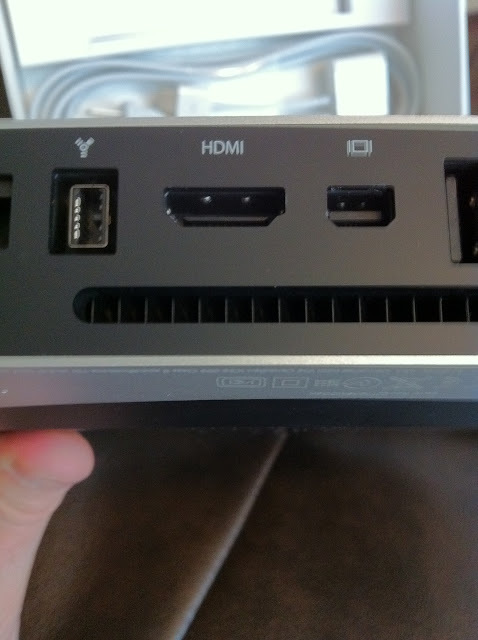 Audio and video are both sent to the HDTV over this single HDMI cable. Boot up went smoothly and I have NO over scanning issues (where the screen extends beyond the display). Worked perfectly out of the box. My Mac mini came with Snow Leopard 10.6.6. I will be updating this to Lion very quickly. Yet another image where I forgot to turn of the HDR option on the iPhone. Drat! 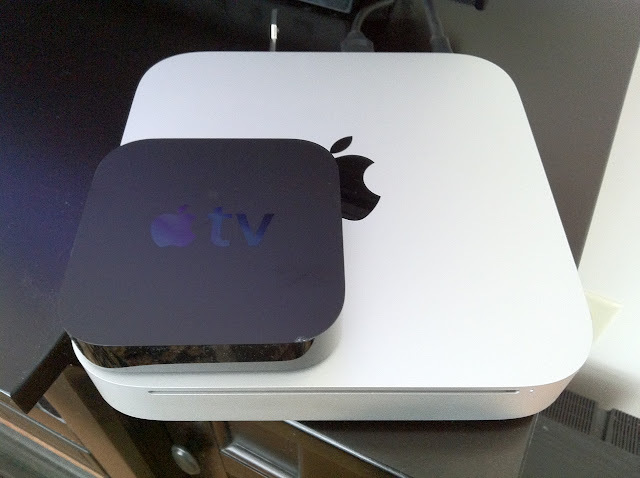 Here is the Mac mini next to our Apple TV. We will use the Apple TV in another room to provide AirPlay/Netflix/iTunes capabilities to smaller Vizio HDTV. There you have the first images of my Mac mini being converted to an MMMC. Any questions? Post them in the comments section below.